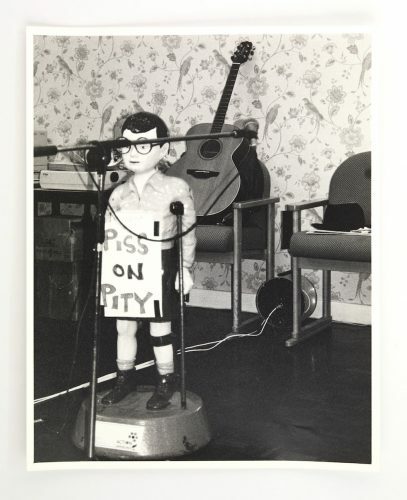 DAO asked Tony Heaton to kick off this years’ Disability History Month with a selection of his ‘top five’ items from the National Disability Arts Collection and Archive (NDACA). When Colin Hambrook asked me to say something about my choice of the National Disability Arts Collection and Archive it was both a privilege and a challenge – a bit like choosing songs for Desert Island Discs – in that I was looking for objects that had resonance for me rather than an exercise in ranking artwork in the collection. This is what I came up with in no particular order, though on a different day I might change my mind as there is much to choose from and I hope much more to come as the NDACA grows and develops. Have a look and select your favourites! It’s hard to imagine looking back at how good it felt to have this modest publication drop through the letterbox. 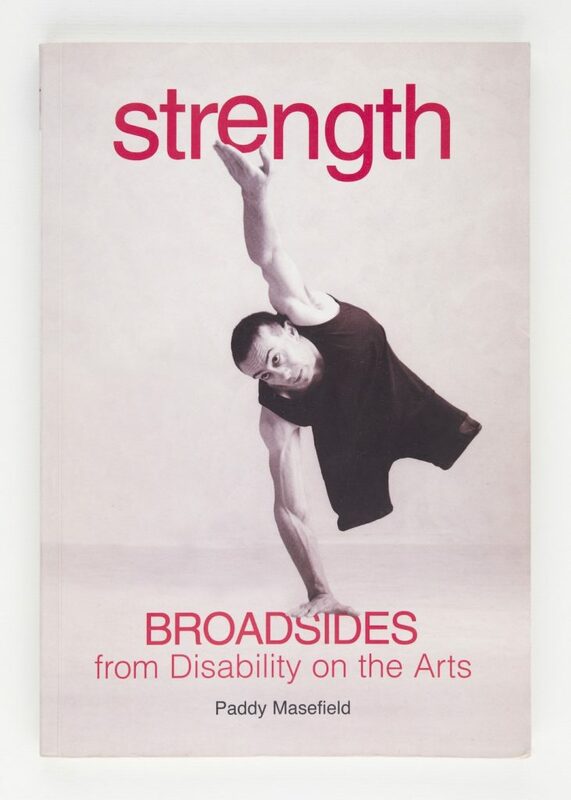 It was the tangible evidence that this nebulous but burgeoning thing called Disability Arts actually existed, and, that there were disabled artists all over the UK making interesting work that resonated with the politics of disability. This, and the growing sense of the injustice of our oppression and the actions disabled people were taking to both protest and to seek positive change. Addressing issues like poor access provision and paternalist attitudes that forced care and control as the only option. This little magazine gave a glimmer of encouragement that there were others out there, creative and resourceful disabled people, many I would later meet, who were passionate about art and social justice. The roll-call of editors formed this history; Sian Vasey, (who with Sarah Scott also commissioned my sculpture, Shaken not Stirred, a great encouragement and opportunity for me), Elspeth Morrison, Kit Wells, Colin Hambrook, Joe McConnell and David Watson. 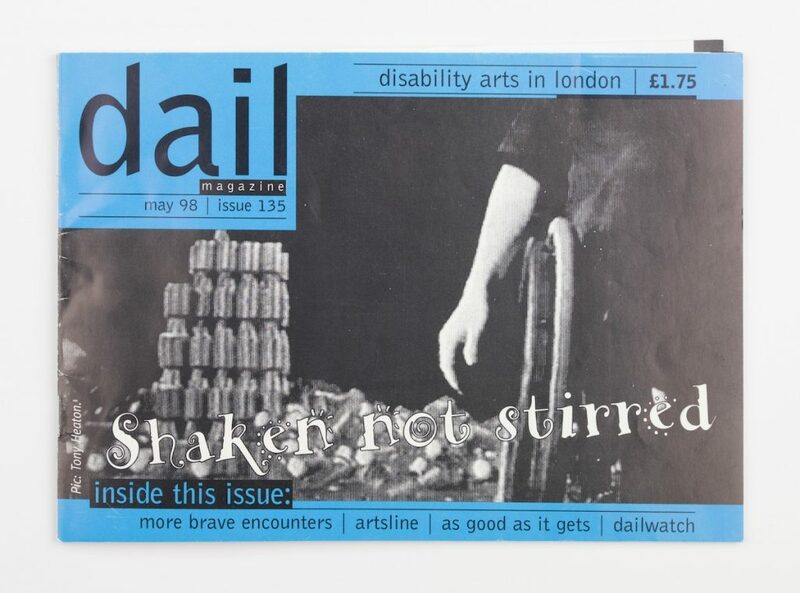 It was unique and considered the most useful and widely circulated publication highlighting and promoting disability arts in the UK, a lifeline to very many isolated and marginalised disabled people. The magazine had its life-support machine turned off when the Arts Council in its wisdom withdrew its funding in 2008. But disability arts was too resilient to die entirely, earning its title as the last avant-garde. Paddy Masefield. Strength. 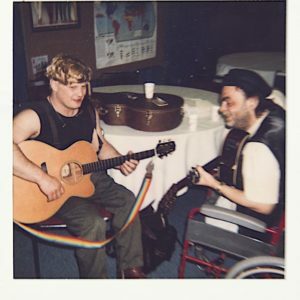 Broadsides from disability on the arts. Published in 2006. This book is a personal reflection and contains detail from the speeches and thinking of the late Paddy Masefield OBE, it’s important because Paddy found himself on the ACE board at a critical time as lottery funding came on-stream. He, luckily for disabled people, became the solitary voice of reason in arguing that if public money was to be spent on public arts buildings then they needed to have full access built into the planning as a non-negotiable condition of funding. Meanwhile, at the new ACE HQ, wheelchair riders have to use a segregated entrance and summon ‘assistance’ to get in. Group Photograph – Attendees of the first Shape Arts and Culture Seminar on Disability Arts. A cursory glance shows an old monochrome photograph of a disparate group of disabled people, orchestrated by a photographer to record something. 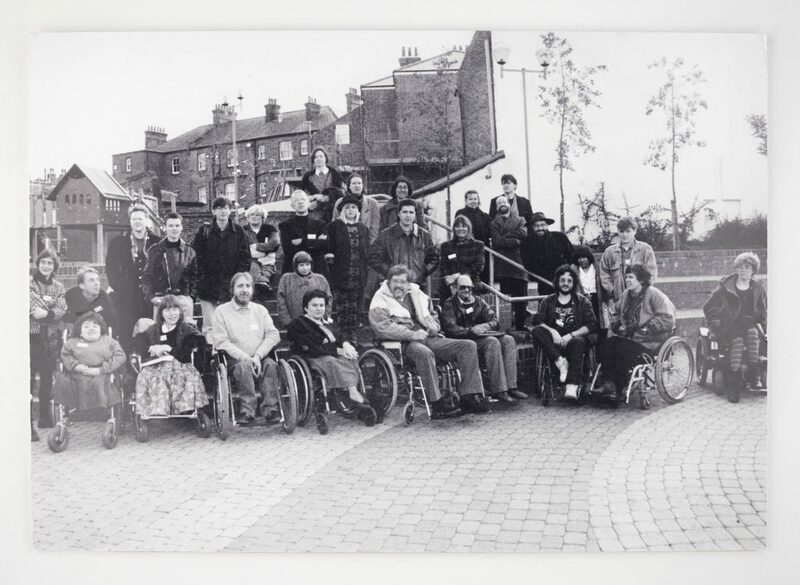 In this case the very first Shape Symposium on Disability Arts, held at Willesden Green Library, London in November 1991. 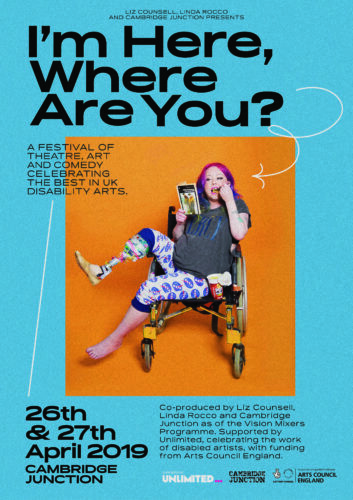 I was there, but I only know this because of Allan Sutherland’s excellent Chronology of Disability Arts, an absolutely vital piece of research that helped make real the vision for NDACA, which was beginning to become a reality at Holton Lee back in 2002. Allan’s chronology is of huge importance when looking for historical context, for example, without the Chronology would we have remembered the outrage among disabled people when they find that back in 1989 the Arts Council is applying for exemption from the employment quota? An Open letter in DAIL to Luke Rittner, the then Secretary General of the Arts Council, by Allan Sutherland, takes issue with the ACGB’s application for exemption from the employment quota for disabled people. The Government quota system that compelled large employers to employ a minimum of 3% disabled people. Or, that the casting of a non-disabled actor to play Christie Brown in ‘My Left Foot’ is widely criticised by disabled people, including actor Nabil Shaban, also writing in DAIL. It was thirty years ago, but some things never seem to change. This photograph holds the memory of many of the disabled artists, creatives and activists, some no longer with us, who have in their own ways been highly influential in keeping the fragile ecology of disability arts and culture alive over the intervening years, and many still do, as artists, writers, filmmakers, poets, sociologists, policy-makers, performers, administrators, thinkers and cultural commentators. 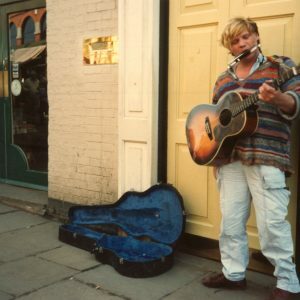 I chose this because Steve was probably the first disabled artist to develop his work by using a computer and headset as a solution to his progressive impairment. I know it seems astonishing now with the rapid development of technology but thirty years ago this was pioneering stuff! He also collaborated with other artists who he used to direct as assistants to create his work, particularly his paintings. I never met Steve, who sadly died in 1994, but soon after his death both our work was shown in the ‘Unleashed: Images and Experience of Disability’ exhibition in January 1995 at the Laing Art Gallery, Newcastle. (Researched and curated from open submission by Katherine Walsh.) For me it was the first showing of ‘Great Britain from a Wheelchair’ and I remember driving it across the Pennines from the west coast in dreadful January weather and getting snowed in on the overnight return! 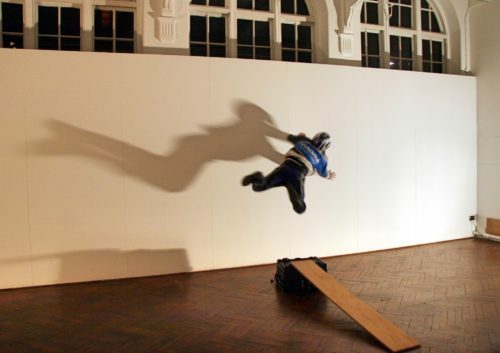 It was here that I first saw Steve’s work and there was subversive humour and ambiguity in much of it. Later I had a T-Shirt with what might be described as a ‘cartoon’ by Steve on it. I hope there is one in the NDACA Collection? The image was of an elderly woman taking a cocky-looking dog with dark glasses on for a walk. The legend below the image reads; ‘Despite his blindness, Bonzo leads a full life thanks to the devotion of his faithful guideperson Mrs Ada Pennington’. 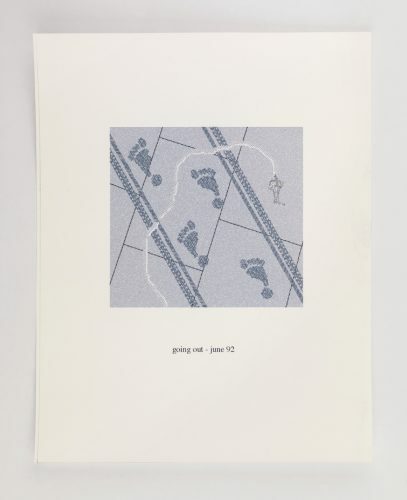 Steve came from a family of artists, his grandfather was assistant to the sculptor Eric Gill, so Steve would be very familiar with etching and lino or wood block printing, and this is reflected in his work. An early pioneer, he was also a great disability rights activist, much of his work addressed the irony and black humour often found in his experience of engaging with the world as a wheelchair rider and the lack of access and the attitude of others. He stood as a councillor, was arrested on a campaign for access to public transport and wrote eloquently about the difficulty the police had in arresting him, no access to the court and the subsequent dropping of the case… too difficult! Well, he toured the USA with the Tragic but Brave Roadshow, taking the stage with Wanda Barbara, aka Barbara Lisicki, Johnny Crescendo and the late Ian Stanton. He wasn’t human, he was a dummy, well, a charity collecting device, both or either of these life-size plastics stood passively outside of shops and those that could reach dropped coins into their begging bowls. Well, when the roadshow disbanded he disappeared, but there is a rumour that Chip now resides in Barbara Lisicki’s bathroom… as a toilet roll dispenser. A really fascinating set of articles. I can name 21out of 29 of those attending the Seminar, but I’d forgotten the photo being taken.